If your kitchen is starting to feel small and cluttered, odds are good that you need more kitchen countertop space. But what material will you use to complement your kitchen designs and color scheme when you expand? 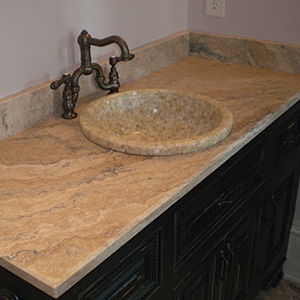 The answer that many homeowners and kitchen renovators in Nashville come up with is stone. If you’re getting ready for a big renovation project in your kitchen, the odds are good that you want it to last. Nothing lasts and looks as great as a good stone kitchen countertop. Which stones countertops complement a modern kitchen design? Modern kitchen designs are the current trend. With all of that stainless steel and hard lines, what room is there for stone? Plenty! Many modern kitchen designs are perfectly complemented by a granite, marble or quartz countertop. Granite and quartz countertops tend to be more popular as they have a wider color choice to perfectly match a monochromatic modern kitchen, but we have seen some get away with white marble countertops before. Color choice for a granite or quartz countertop in a modern kitchen comes down to your design. Many choose stark blacks for their kitchen countertop, quartz and granite can certainly do black. Check out our own Absolute Black granite, or Dreis quartz as examples. Other tones can be used, our granite and quartz lines combine for over 110 colors! Which stone countertops complement a country kitchen design? The other popular kitchen design scheme in Nashville is the classic country kitchen. Stone is a natural fit in these kitchens, with a roughly finished granite being a popular choice. The name of the game here is ‘natural,’ and that’s what stone kitchen countertops are! A perfectly smooth and glistening granite countertop is quite a pretty sight, but a slightly more roughly finished style is more common, and a better fit, for country kitchen styles. Color choices are almost always earthy, for a true fit try a more local looking stone than an exotic one. 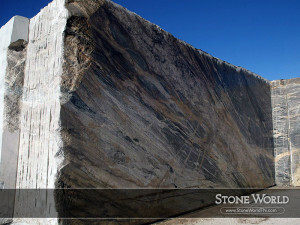 Our team here at Stone World are the go to stone kitchen countertop group in the Middle Tennessee area. Contact us today for advice on how to expand countertops to boost kitchens, or take a look through our kitchen gallery to start finding inspiration. We’re going green in the kitchen and bathroom in this article, and I’m not talking about eating your vegetables, or even breaking out a can of forest green paint. People here in Nashville are becoming just as green conscious as people everywhere else across the USA. I’m going to look at the most eco friendly countertops that we offer here at Stone World. It is incredibly dense, the fourth hardest natural substance on earth, and will not need to be replaced due to chipping or scratching. Quartz countertops are typically Greenguard approved, meaning that they offer a high indoor air quality rating. Not only does quartz offer these green features, but it also looks great with a wide variety of kitchen and bathroom styles – keeping you, or the next person to own your home, from having to install new kitchen countertops when design ideas change. Granite countertops are incredibly popular. Since they are mostly made up of quartz, they offer a number of the same features as the greenest choice above. The difference is that a granite countertop will have to be sealed periodically. These sealing chemicals are commonly of a complex chemical composition, their constant manufacture can not match with the need to never seal quartz. There is no questioning how beautiful marble countertops are. Marble has been used for countless years to decorate the most remarkable of homes. The problem with marble as a green kitchen countertop material is that it needs to be sealed fairly often, more often that granite at least, and it is softer and more prone to having to be replaced after a few decades. There is a balance that can be reached between being green and getting the bathroom or kitchen countertop that you want. Our team at Stone World will be able to help you find the right combination of longevity and ease of maintenance that will make your choices for eco friendly countertops to be a good ones. Our team of stone experts, and design consultants, have helped many homeowners in Nashville, and the surrounding Middle Tennessee area, make the choices that best suit their eco friendly goals, as well as their design goals. Diversifying the living spaces in your kitchen or dining area is a popular trend amongst homeowners in Nashville. They’re looking for new ways to use and enjoy their space, and a breakfast bar is a great way to do this. But where and how will you build one in your kitchen? Here are our tips. A breakfast bar is, most commonly, an extension of your kitchen countertop. Chairs and people can tuck up under the kitchen countertop extension. There are many different ways to extend your kitchen countertop past the cabinets of your island. This is an easy breakfast bar addition as all you have to do is purchase a new kitchen countertop that will accommodate those seated at the bar. Many kitchens feature a pass through, that window which is cut into a wall and leads from your kitchen to a dining or living area. Adding a breakfast bar to this space is similar to adding it to an island, but with some slight complications. The shape of your island will likely be some sort of rectangle, extending it is easily done. The shape of the kitchen countertop that connects to the pass through is likely already a rectangle, and will need another shape added on to it. If you want your kitchen countertop and breakfast bar to all be one piece you’ll have to find a way to get one heck of an interesting piece cut. 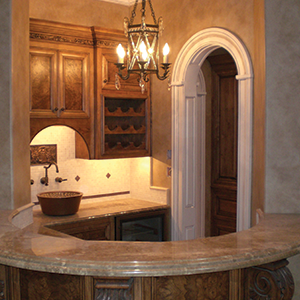 It is more common for the kitchen countertop and breakfast bar to be two separate pieces of material in this case. For those that don’t have an island or a pass through, many people in Nashville are adding a simple fold down table that is attached to the wall as their breakfast bar. The advantage is that you can put it anywhere you like: near a window, out of the way, or right next to the fridge so you can reach in for orange juice whenever you want. Check out our kitchen gallery for ideas on what’s possible with kitchen islands, pass throughs and your breakfast bar. Contact our design team for help with your kitchen countertop and breakfast bar questions, or when you’re ready to get building! Each one is different, and offers something different to you during a remodel or update. I will outline the differences and benefits of each so that you have a clear understanding about What is Right for Your Kitchen so you may have the ultimate benefit. What’s the difference between a refinish and resurface of your kitchen countertops? Refinishing is when you repair and re-coat the surface by adding more material on top of the current surface. This is done quite often with laminate kitchen countertops. Resurfacing a kitchen countertop involves removing an amount of the countertop itself, either by sanding or stripping a layer off, and then adding a new surface on top of this. These approaches are both used to extend the useful life of a kitchen countertop for around 10-15 years on average. They will not, however, do much to add brand new value to your home. Replacing your kitchen countertop is beneficial for those with the above three points in mind. You’ll be able to add all new value to your home, and give your kitchen an all new look. 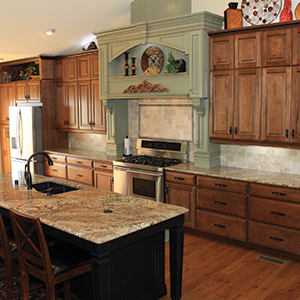 What is right for your kitchen: Refinishing, resurfacing or replacing your kitchen countertops? If you’re unsure of what is right to do after reading the article above, our team at Stone World are ready to answer the specific needs of your unique kitchen countertop situation. Our design team has helped many people in the Middle Tennessee area find the right option thanks to their expert knowledge. Your kitchen is one of your most often used rooms, and is certainly the one which you want to stay clean and not have intruded upon. This leads to many people in Nashville looking for ways to cut down on the intrusiveness of a remodel of their cabinets and kitchen countertops. I’ll give you a few tips on how you can cut down on visits to your home, while still getting an exceptional cabinet and kitchen countertop installed in your home. You can get these measurements done yourself, and minimize the invasiveness of a kitchen countertop installation. As an added benefit, you can sit back and know that the finished kitchen you’re in was your idea and vision. If you dread having to clean up dirt that is tracked all over your house from workers going in and out, find a manufacturer that will have your cabinets ready-made, and will pre-cut your kitchen countertop at their facility. There will inevitably be a few screws sunk into the walls, but the sawdust and dirt associated with building your kitchen cabinets right in your home or backyard is not something which must happen. The best kitchen countertop suppliers will also be able to cut your chosen material to size before it arrives at your home. The team here at Stone World can help you design, find, and cut your kitchen countertop in granite, marble, or quartz, without ever setting foot in your home until we deliver the finished product. Our designers are here to help anyone in the Middle Tennessee area who are making decisions about custom countertops in the kitchen. 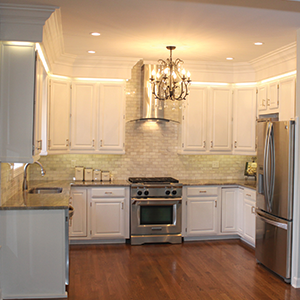 They’ll work with you to make your custom kitchen remodel go as smoothly, quickly, and noninvasively as possible. 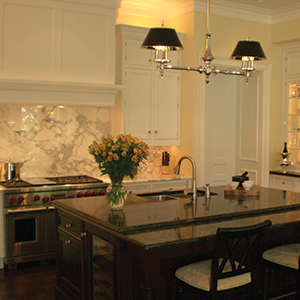 Granite countertops have often been synonymous with quality. There are a lot of reasons for this, and despite new trends emerging over the years, granite is still a top choice for homeowners because there are several advantages to using granite. First and foremost, granite is timeless. Because it’s a natural surface, it has an ability to be strong, illustrious and durable all at the same time. The durability, specifically, is one of granite’s major advantages because after installing granite countertops, it’s likely you won’t have to replace them for quite some time. Another great aspect of granite is that because it is natural, it’s able to withstand high amounts of heat; that means if you bring a pan straight out of the oven you don’t have to worry about ruining your countertop if you set it directly on granite. It can take the heat. More great advantages using granite is the value of granite also doesn’t go down over time like other surfaces, which means that it can only help increase the value of your home. Plus, because it is found naturally, there are essentially endless varieties of granites in terms of color and style — this variability can give you a lot of options if you’re looking to add granite countertops to your home. Last, but certainly not least: granite is low-maintenance and quite easy to clean. You don’t have to worry about stains setting in or water or other liquids ruining the surface. Even though it runs more expensive than other countertop options, you will certainly get what you paid for when it comes to granite. Visit StoneWorldTN.com to learn more.